The SM Mindset Series… EXPECTATIONS. I have been thinking a lot lately about the definition of various laws in regards to how we use social media. In this, I would like to take a moment to focus on one in particular as it relates to a common mindset I encounter as I meet with artists, authors, small business owners, marketing departments, and non profit organizations. Recently, I uploaded a brief few comments on the mindset of making money using social media. I recorded these thoughts based on questions I was hearing a lot concerning how one makes money using social media. Mostly, these were questions that were tinged with an underlying skepticism. My argument is that it is a mindset and that you cannot apply your old way of thinking to how you use and gauge success in your social media endeavors. As I have said in the past… we need to seek not to apply our old wineskin way of thinking to all of this new wineskin way of delivering. For one, and much different than the traditional advertising channels… social media is a 2-way conversation. It is NOT to be used like traditional methods. I think we tried that with email and now, many stats are showing that 90% of email is spam. Certainly, for some… email still can be effective. But, for me, I now communicate more via Facebook, Twitter, and text messaging then I do with email. It’s cleaner, I have more control, and it’s conversational in nature. When someone is constantly bombarding me with the sell, sell, sell, sell… I quickly disengage, or… in the world of Facebook… I unfriend. In fact, the New Oxford American Dictionary named the word of the year in 2009 to be none other than…. unfriend. All this to be said, as I have been seeking to address the question of making money using social media by first discussing the mindset needed, I believe that next hurdle we may face with convincing some of the benefits is the mindset needed when gauging the results or effectiveness of your social media campaigns. If your mindset is firmly in the camp of… I just don’t think it’s worth it, then… I am not sure you are ready to drive a social media campaign unless you completely trust the person you have charged with carrying it out. In other words, if you are wanting to dip your toes in the water, but are still skeptical… before asking one of your “youthful” team members to jump in, do me a favor and get out of the way. This brings me to one specific law that I have discovered that I believe describes the danger of getting in the way of gauging success while still being skeptical. Often times, what can rightfully lead to this is something called a “hype cycle effect” which can dominate perception of a new approach. To be honest, we have all seen it with various products, movies, shows, books, etc. And to really be honest.. we have all fell victim to this effect at one time or another. However, in this case, I believe we can arrive at the same assumption, by way of our own skepticism. 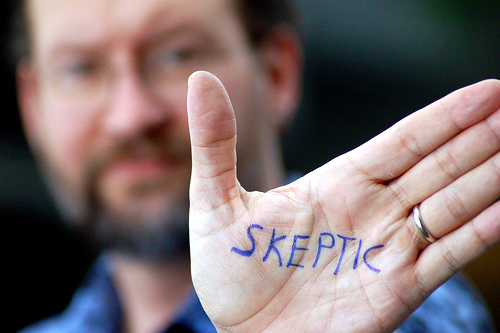 Quite frankly, often times with new technology shifts or new message delivery channels being introduced, our skepticism is a result more from our own fears than anything else. Often times, the proper amount of time was never even a consideration when launching a new strategy, thus the overestimation of the effect. Sadly, many of have been here before…. If we build a website, our lagging sales trends will suddenly disappear. If we build a coffee shop, the “youth” or the “young people” will suddenly show up and shop. Sadly…. we’ve missed the point. Of course, some of you might be thinking about the classic statement from the movie, Field of Dreams, that said… If you build it, they will come. I also remember watching an old Warren Miller ski film where they featured these folks who built a chair lift on a mountain of dirt… not snow. In that, they too said… If we build it, they will come. Do you have an iPad? No? Why not? If there ever was a hype cycle effect in action, we are experiencing it right now. But, what if we never had the iPod, or the iPhone, or the iTouch, or the macbook? Certainly for products or brands with no history or track record to go by, we see major marketing efforts go in effect in order to seek control of the perception. Sometimes the “game of telephone” they play with consumers work, and sometimes it doesn’t. Often times though, it should warrant good old fashioned skepticism. How come when you build it, “they” don’t always show up? I think too often, the answer to this lies within how one defines what it means to show up in the first place. Too often, we lack the vision in the first place to truly execute a new strategy based on our own objectives and understanding because we are all too quick to fall prey to the hype. Therefore, we launch with no sound measurement tools, execution strategies, or foresight in hand. The result is almost always disappointment and even more skepticism. Oh, but we had to have that coffee shop in order for us to survive. So, we tend to overestimate the effect of a technology in the short run and underestimate the effect in the long run. That’s not on the technology friends… that’s on you. It’s a mindset and in order to effectively delve into this brave new world, one needs to change the way they think or quite frankly, return to the very reason you are in business in the first place. I mean, don’t you love heartfelt interaction with the consumers of that which you offer? If you no longer do… get out of business as fast as you can because the brave new world is all about the relationship, not the sale. What social media offers is a chance to build lasting relationships with your base that are also trackable. How often can you truly say that about traditional methods? In the past, we relied too heavily on the sale to bring forth the relationship. Personally, I don’t think that is sustainable or even profitable. But, what is… is beginning to understand that with investing in relationship will in fact, bring forth the sale. So, as you can see, we need to change the way we think. And for some… sooner rather than later. This is going to take time. It will NOT happen over night. There are a lot of exceptional resources out there for your review to decide what channels are best for you as well as best practices, etc. for them. This new technology is here and will not go away. It will evolve, but, if you know who you are and where your base is hanging out online, you can make it. (and believe me, the data will show that they indeed, are online.) But, only if you relax and seek to be yourself and not someone you are not because that’s how you are “supposed” to act with all of this stuff. Social Media use should not be measured primarily on the amount of dollars and cents it creates, but rather on the quality of engagement one has with their followers. This will equal capital, which in turn will equal loyalty, which in turn will equal revenue. Got all that? Great! Tell me when you figure it out, because I’m still trying to. The point is… we are all experiencing this radical change together. And, as we have learned from the past… it is always…better together. It’s all there for you and the beauty is… it’s waiting. Nice article Gunnar on the social media mindset. I have tried to relate that also to people I work with, that very same idea, the sale will be the result of the relationship. There are still many though who want to put the sale ahead of the relationship.